Old Man Creek is tidal to a point upstream from the B & A Boulevard (MD 648) road crossing (see below). However, it is so short it is the only creek on the south shore that is not shown on the USGS topographic map as crossing Ritchie Highway, of the creeks from Dividing Creek upriver. However, there is a dip in Ritchie Highway just south of Magothy Bridge Road and just north of Coachman’s Road that is probably made by the headwaters of this creek. Old Man Creek has several bends in the tidal portion, which probably contribute to the fairly poor water quality in the upper tidal portion (see below). The tidal portion was dredged in the winters of 1995/96 and 1996/97 (? ), as far as the Stewart’s Landing marina (?). Beard’s Mill was on Old Man Creek, which was once called Beard’s Creek. The mill is shown on the south shore of tidal portion of the creek in Taylor (1998) in a map on page 61, but it’s not clear how a mill on a tidal creek would get enough water flow, unless it used tidal flow, or a long mill race from the non-tidal portion. Old Man Creek was shown as only an embayment in the 1795 (page 54) and 1878 (page 70) maps that she included in her book. There was a bathing beach on the south shore of Old Man Creek near its mouth, Magothy Beach (see map on page 104 of Taylor 1998). algae blooms, and low bottom dissolved oxygen, especially after the channel was dredged in 1996-97. There are ephemeral beds of horned pondweed (Zannichellia palustris) in the shallows in the spring. Near the upstream limit of navigation in a small boat, there is one bed of sago pondweed (Potamogeton pectinatus), mixed with horned pondweed. The nearest other known bed of sago pondweed is at the mouth of Blackhole Creek (see below), so it is not clear how the seeds or shoots that started this bed got here. 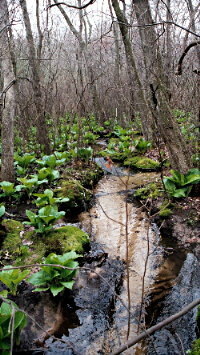 Old Man Creek has a small watershed and thus a short non-tidal portion. It starts just south of Magothy Bridge Road and just east of Ritchie Highway, near the end of Coachmans Road.